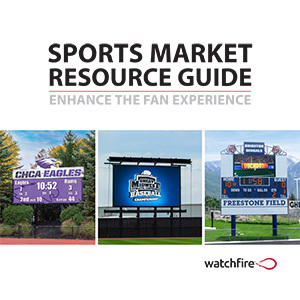 Take fan experiences, team branding and advertising revenues to the next level with a virtual scoreboard or video display from Watchfire. Our displays create great in-venue atmosphere with scoring, live and replay video, animations and digital advertising capabilities. Watchfire offers fixed digit scoreboards that can be paired with video displays, either at the time of installment or during system upgrades. This combination creates an attractive and versatile system that enhances the game-time excitement and generates revenue. Learn more about our fixed digit scoreboards, video displays or virtual scoreboards in this free product guide.